Khadi create 100% plant based vegan hair products. They only contain ingredients good for your hair and won’t use any harsh chemicals. This is ideal for me as I have pretty much ruined my hair over the years with bleach so I have been trying to use more natural and gentle hair products. Not only are they better for your hair but if you have un-naturally dyed hair like me then natural products will prolong your colour. I have been using the amla volume and gloss shampoo which is suitable for all hair types and also the vitalising hair oil which provides volume, stimulates hair growth and prevents hair loss. “Amla Shampoo contains the correct combination of Ayurevdic herbs to create volume and gloss. Amla shampoo with it’s low ph, cleanses and conditions your hair giving it elasticity, helping to prevent moisture loss and at the same time giving your hair shine, body and volume. The fragrance of Ylang Ylang in Khadi Amla Shampoo not only adds to the aroma but helps stimulate hair growth. Amla – Rejuvenates scalp and hair, stimulates hair growth and naturally conditions hair. 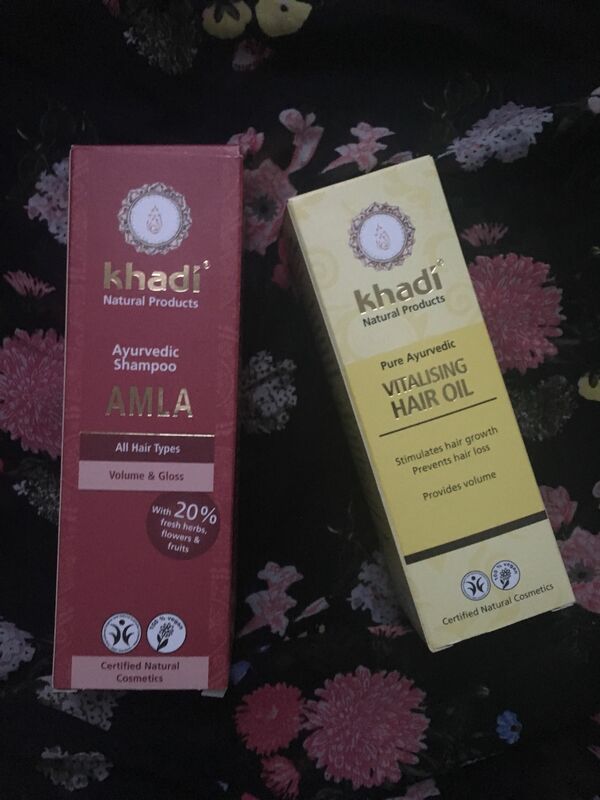 “Khadi Vitalising hair Oil is a hair oil to help stimulate hair growth using herbs, flowers and oils from India from an Ayurvedic formula. Vitalising Hair Oil is a pre-wash conditioning treatment and as well as stimulating hair growth the hair oil helps prevent hair loss whilst giving volume and revitalises dry, dull and damaged hair. Palash, Indrayan and Rosemary helps stimulate hair growth and strengthen roots. As you can see,both products are great if you are looking for hair growth. My hair always struggles as it breaks off before it has a chance to grow due to being so damaged. I have tried a lot of things to try to get it back into better condition and to help it grow longer and healthier. I really liked the shampoo as you don’t need to use much and I noticed it didn’t fade my hair colour as much as my usual shampoo which was a colour safe one! I absolutely love Khadi Haircare! Their products are amazing! They contain all natural ingredients. Great to hear that they’re working out for you. I might give it a try! I’ve not heard of this brand before but the products you’ve used sound great. I’ve heard a little about Khadi, but this definitely helped me gain even more information other than they are a vegan brand. Great post! Ohhh I love anything Ayurvedic!! I’ll have to try these! This sounds really interesting. It’s so good that there are more vegan and natural products around now!